Auction Fundraiser - Fundraising DIY - Crowdfunding fundraiser! A crowdfunding fundraiser is asking people to donate money for a specific cause or project. Crowdfunding is useful for a variety of opportunities, whether fundraising for disaster-relief, medical bills, a new church sanctuary, creative projects, school band uniforms, creating a salable product, or creating a start-up. 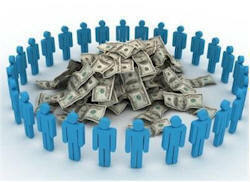 Crowdfunding fundraising platforms allow you to market your project, generate interest, and receive funds. It is not limited to certain kind of project. There is no discrimination! Only great ideas! Crowdfunding fundraising can be fast, efficient, and effective if done right. The more creativity and fun you have, the more likely you’ll get funded. You share your crowdfunding fundraiser using social media such as Facebook, Twitter, Email, and Instagram. People can make an instant cash donation to your group or cause. Here’s an excellent example: Social media is blamed for a lot of wrongs in today’s culture, but for Paul D’Amico, Facebook helped turn his evening walks into a crowdfunding fundraiser for pediatric cancer patients at Children’s Hospital of Philadelphia (CHOP) that has raised more than $40K. D’Amico, a math teacher at Philadelphia Academy Charter School, said he started walking in December for health reasons. When he began posting photos of himself at different locations around Springfield, he started receiving a lot of support from friends and family on Facebook. He was a couple weeks in when he ran into an ex-student who was undergoing treatment for cancer and on the walk that night wondered if he might be able to channel the outpouring of support toward a good cause. “I thought I had to do something. So I made a text, on Facebook, that asked the community, ‘I have this idea, if you’re interested, let me know and I’ll walk to your house and I’ll collect money and we’ll start a little fundraiser for CHOP,’” D’Amico said. A simple premise: A person in Springfield would message D’Amico and pledge money for CHOP and he would walk to their house and collect it.